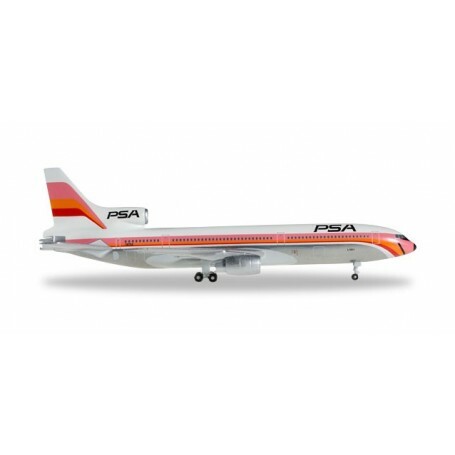 Flygplan PSA Pacific Southwest Airlines Lockheed L-1011-1 Tristar, modell i metall. Founded in San Diego, California in 1949, PSA was valued by passengers due to its friendly and jovial service. 'The Worlds friendliest Airline', as its slogan promised, operated a few Lockheed TriStars in its eyecatching and bright livery and with the signature smile painted beneath the cockpit in the mid of the 1970s.